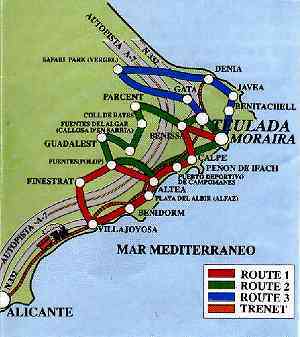 SPAIN TOURIST INFORMATION - ALICANTE REGIONAttractions and accommodation on the Costa Blanca: BENIDORM MORAIRA JAVEA GUADALEST ALTEA. Complete tourism resources: hotel lodgings and self catering accommadation, holiday houses and villas. Jesus Pobre: Rental villa with separate annex and pool. for the perfect family holiday in a quiet rural location near to the beaches and golf on the Costa Blanca. 5 bedrooms, sleeps 10. 2019: Good availability - please enquire..
Holiday rental between Denia and Javea: large 6 bedroom villa with spectacular swimming pool and views - sleeps 12 - 14 2019: Good availability - please enquire..
Orba:Luxury villa / apartment with pool for rental near Vall De Laguart, Costa Blanca spectacular views. 2019: Good availability - please enquire..
Moraira: Luxury Spanish style Villa rental with 5 bedrooms, 3 bathrooms, air conditioning and pool, sleeps 10. Only a few minutes from local beaches and near golf courses. 2019: Good availability - please enquire..
For holiday accommodation throughout the Spanish holiday resorts, you might find this file useful. It contains holiday property to rent for your vacation throughout the whole of the Costa Blanca including JAVEA GUADALEST and ALTEA. If you would like to tell a friend about the holiday rental accommodation file, give them the URL address http://www.info-world.com/spain/rentals . If you are looking for property to buy in this region of Spain, then please scroll lower for some Spanish estate agents. If you know of any other really useful sites, please can you email me and I will add them. Benidorm Central de Reservas. La mayor Central de Reservas. Más de 100 hoteles y apartamentos. Gemelos II Apartment situated in the Levante beach. Benidorm apartamento Gemelos II Apartamento situado el la Playa de Levante. Some of the designs are great fun! So when you return and have with an inflatable for the collection please could you email ? - and I'll pay the postage. COSTA BLANCA, Moraira, 2 bedroomed, fully equipped self catering holiday accommodation incl. Sky tv, behind European shopping centre, reasonable rates. tel. 01382 533930 or email from here The house is is comfortable, nicely furnished with Monet and Renoir prints etc. and a whole lot better than the average 'self-catering apartment'. In addition, Moraira is an especially attractive traditional village with lots of local charm. 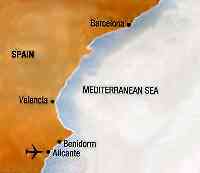 It is near to Benidorm with the best climate on the Mediterranean but with no hideous concrete in sight! Cybercafe Benidorm. Cafe - Estudio en el centro de Benidorm donde disfrutar navegando por INTERNET. BELGIUM - Alicante, Avenida del Catedratico Soler 8, Entresuelo B, 03007. Hon. Consul: Sr José Antonio Puche Garrido. Tel. 5929147 or 5929148, open Monday to Friday, 9.00 a.m. till 2.00p.m. GERMANY . Alicante, San Francisco 67-4. Tel: 5217060. Hon. Consul Herr Dieter Fahnebrock. NETHERLANDS - Alicante, C/Castaños 29, 1st floor. Tel: 5212175. Hon. Consul Ignacio Maria Compos Belda. Benidorm, Edificio Cervantes, Avenida de Europa, s/n. Tel: 5857012, Hon. Consul Mr. E.J. Richelle y Angemeer. UNITED STATES OF AMERICA: Valencia, Calle La Paz 6, 3º, 46001, Valencia. Tel: (96) 3516973. UNITED KINGDOM: Alicante, Plaza Calvo Sotelo 1, Tel: 5216022 and 5216190. British Consul, Mr. P. Campbell. Vice-Consul Mr. A. Santolaya. 8.30am. to 14.00pm. Monday to Friday. For holiday accommodation elsewhere in the Spanish holiday resorts, you might find this file useful. It contains holiday property to rent for your vacation throughout the whole of the Costa Blanca including JAVEA GUADALEST and ALTEA. If you are looking for property to buy in this region of Spain, then please scroll lower for some Spanish estate agents. If you know of any other really useful sites, please can you email me and I will add them.